If the keyboard on your Android device just doesn’t cut it, if it’s had you on countless occasions spouting off expletives like there’s no tomorrow, then help may be at hand – provided it’s not the Nexus keyboard which is the cause of your typing woes, that is. 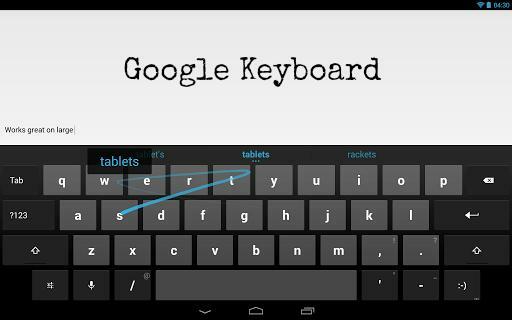 Google has just released its Google Keyboard app – previously only found on its Nexus devices – for those with handsets and tablets running Android 4.0 (Ice Cream Sandwich) and above. Available now from Google Play, the free alternative offers gesture typing (allowing you to ‘glide’ through the letters to make a word), voice dictation, automatic error correction, next-word suggestions and current-word completions. The 15-megabyte app also loads up with dictionaries for 26 languages and incorporates keyboard layouts for a slew of countries. While the app is currently only available in Play stores in English-speaking locations, the Mountain View company says it’ll be rolling it out in more Play stores around the world soon.